As late summer transitions into early fall, many homeowners are planting new grass or fortifying their lawns to prepare for the upcoming cool season. Aeration is a vital part of the grass growing process. Aerating soil alleviates soil compaction—density built up over time by playground sets, rough-housing children, barbeques, and four-legged friends. Through aeration, soil is broken up so that oxygen, water, and nutrients can penetrate grass roots. This allows the grass to grow more deeply, producing a stronger, tougher lawn. Some homeowners hire landscaping companies to aerate their lawns for them. This is a great time-saver, but, for homeowners who prefer DIY lawn care, no worries! Our step-by-step guide makes the aeration process easy and stress-free. Before you begin aeration, make sure you have the necessary tools. You’ll need a yard aerator, either power or manual. 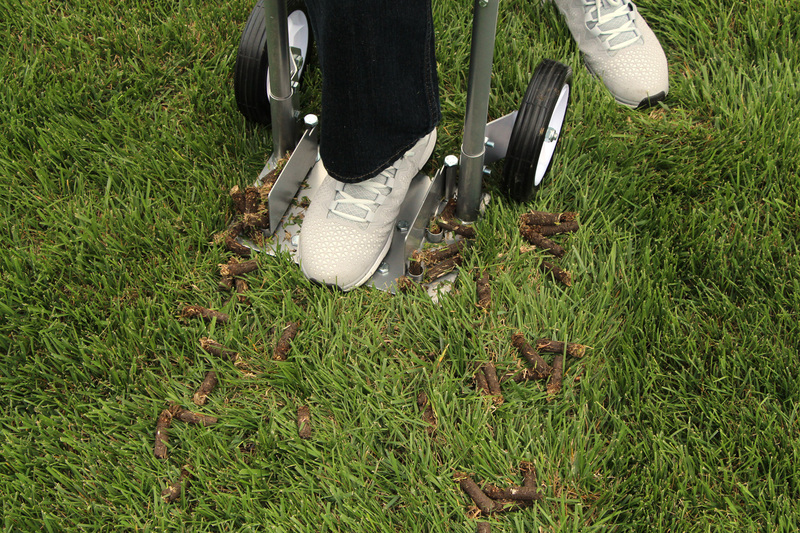 A power aerator runs on gas and uses spikes or a coring system to poke holes in your lawn. If your yard is large, a power aerator will save you a lot of time. If you have a small yard, a manual aerator should do the trick. Manual aerators are push powered and also use a spike or coring systems. Both kinds of aerators can be rented for cheap at hardware stores. Before you begin, you should make sure your lawn is clean, tidy, and ready to be aerated. Rake up debris, clear trash, water your grass, and mow. If your grass is overgrown, the aerator will have a hard time reaching the soil. Operating an aerator is similar to operating a mower. You’re going to start at one corner of the yard and aerate in strips until the entire yard has been covered. You should not cover the yard more than once, unless there is an area that is used heavily and needs extra attention. If you go back over an area, aerate in the opposite direction for maximum effectiveness. Once you’re done aerating, leave the holes in your yard alone. Over time, they will fill with healthy nutrients! Aeration can leave your lawn vulnerable for a short period of time. Applying compost or a fertilizer will help it power through and give your grass some added nutrients as it begins to grow. Once fertilizer is put down and seeds are planted, you’re in the clear! You can now look forward to a beautiful lawn in the seasons to come.